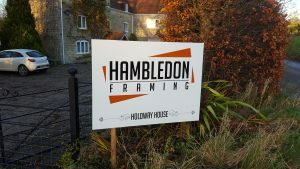 I’m delighted to say that Hambledon Framing is up and running! I honestly didn’t think moving premises whilst simultaneously trying to move house, re-brand, update the website to our new name and details would take so long! The small matter of helping to look after twin two-year-olds, didn’t make things any easier either. Anyway, weeks of lugging about machinery and equipment has eventually paid off and I’ve now completed my first two pieces under the shadow of Hambledon Hill. 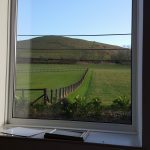 Our new location, on the outskirts of the village of Child Okeford couldn’t be more picturesque- the downside being that the beautiful view from my window can be a bit of a distraction. I was lucky enough to spy a red kite, hovering above the Hill yesterday, but not quick enough to photograph it, sadly! To publicise our relocation we’ve also put an advert in the latest edition of the renowned Blackmore Vale magazine. It was a bit of a thrill to be browsing the Pilgrim Fryer’s copy whilst I waited for my fish and chips last night and see my own advert! No one else in the queue seemed to share my enthusiasm… probably just the weather. If you spy our advert and have need of our professional services then don’t forget that we’re offering a 10% discount to new customers in the run up to Christmas.